You can combine Ozeki SMS Gateway with a MySQL database to send, receive and store SMS messages. In this tutorial you can see how to install and configure the connection with the proper connection string and how to create the recommended database structure. The solution uses Ozeki SMS Gateway installed on your PC. The Database User of SMS Gateway can easily communicate with your MySQL database user through an ODBC driver which is an essential part to send or receive SMS messages with a MySQL Database. Please download it from mysql.com and learn how to install it. An ODBC v5.3 or higher is recommended, so you can have unicode character support. For example Chinese or Arabic. 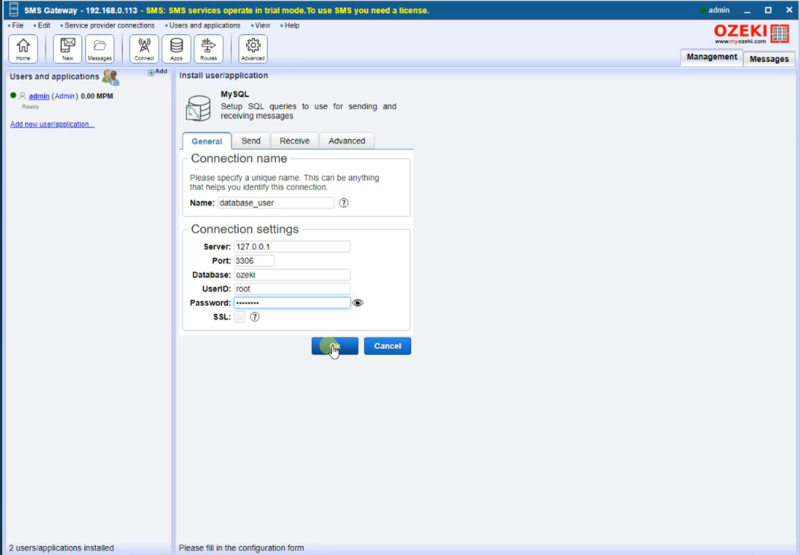 After you have installed the ODBC driver, please configure a Database User, which is essential in connecting Ozeki SMS Gateway with your MySQL database. The connection string only works if it matches your database details. You should start by changing the IP address from 127.0.0.1 to the actual IP address of your MySQL server. Then replace the database name and also the username/password pair. Choose a user who has granted access to the database. Please maintain the 'id' field in your database to support faster SQL updates. If you modify database tables. For example if you add additional columns, please review the SQL templates used by Ozeki SMS Gateway. Please make sure that they are compatible with the customized database table layout.